It’s 3:00 on a Wednesday afternoon and my flight has just landed. I power on my cell phone to check my messages. After briefly listening to the first two, the third message captures my attention. In a deep bass voice, reminiscent of James Earl Jones, the caller says “Mr. Mason can you please give me a call.” He leaves a number but no name. He begins the conversation by telling me a little about how he came from a small town and that only his mother believed in him as a child. It’s clear as he talks, he has a deep rooted love for his mother and that he misses her dearly. “I want to Sponsor students from seven high schools in different parts of the country.” “You know why I picked seven?” he says. I say yes and we both laughed. My sister’s son used your application and she talked about how he received so many scholarships and that he went to one of the HBCUs on your application. “Saved me from having to pay his tuition,” he say laughingly. After I was told the amount, I was overwhelmed. Thank you for your generosity. Your support will help thousands of students. I will be sure to let the schools and students know about your act of kindness. Mr. Mason that will not be necessary. The only thing I ask is that this stay between you and I. My mother used to always quote this verse to me after I made it in the League. It’s something I’m going to start to live by…Matthew 6:21 – Where your treasure is, there will your heart be also. Two days later I received the check. 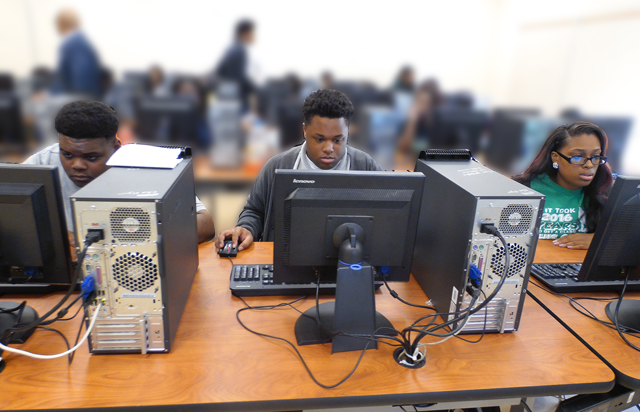 Vigor High School is the first of the seven high schools that will be selected whose students will be given the opportunity to complete the Common Black College Application for free. And to you my Sponsor with the James Earl Jones sounding voice…I’m sure your mother is looking down on you from Heaven and thinking JOB WELL DONE MY SON.